Recently, a mathematical model predicting the extinction of organized religion received global media attention after its presentation at a research meeting of the American Physical Society. According to the BBC news website, the researchers had shown that religion is “set for extinction” in nine countries — Australia, Austria, Canada, the Czech Republic, Finland, Ireland, the Netherlands, New Zealand, and Switzerland. This follows an analysis of 100-year census data using a mathematical approach known as “linear dynamics”. According to the researchers, because their theoretical model appeared to be borne out by actual data drawn from so many different countries, this was strong evidence that it represented a true depiction of real-world events that could be used to predict the future. 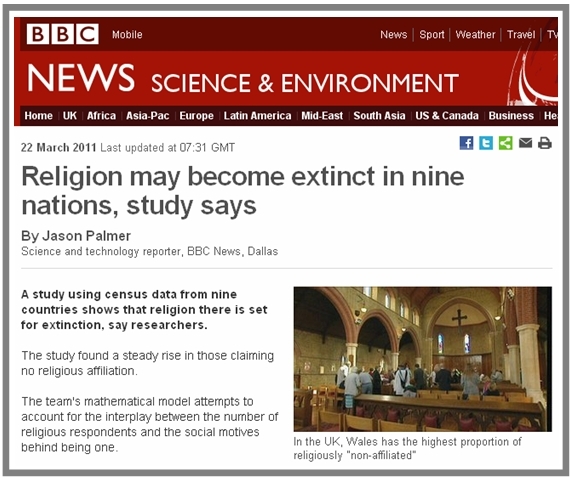 While the BBC headline implied some equivocation (i.e., “religion may become extinct”), the majority of agencies carried headlines implying that religion faces inevitable (and, by implication, imminent) extinction (for example, here, here, and here). (It was during CNN’s coverage of this story that Dr Wendy Walsh chose to discuss the impact of atheism in hastening death during catastrophes). So, have these mathematicians really used science to reveal the imminent extinction of religion? Well, not really. The researchers, led by engineer Daniel M. Abrams, designed a mathematical model to show how the sizes of two competing sub-groups within a community (such as atheists and non-atheists) might fluctuate over time. In this context, a so-called mathematical model essentially amounts to a formula, a system for predicting future numbers based on numbers that are currently known. One important issue to be aware of here is that, contrary to several (in fact, virtually all) news reports, the researchers in this case did not base their model on census data regarding religious affiliation. Rather, they based their model on principles of group formation as they understood them. Only afterwards did they consult census data, in order to see if it resembled the predictions of their model. Their main finding, and the conclusion of their research paper, was that the patterns that they subsequently found in census data very closely matched the model they had designed beforehand. The researchers then used their model to extrapolate forward in time in order to see what might happen such groups in the future. The model showed that one of the groups (the currently larger one) would eventually become extinct. Seeing as their model so closely matched observed trends in the numbers of atheists and non-atheists in nine different countries, their findings were duly interpreted as implying that this was the mathematical future that lay ahead for these societies: that the currently larger group in society, non-atheists, would eventually become extinct. And this is what made their research newsworthy. The first is the assumption that religious groups in society actively compete against one another for members, an assumption that is intended to apply equally to atheists. However, not all religions see it as their role to compete against others for adherents. For example, Sikhism forbids proselytism and does not accept converts. Similarly, modern Judaism generally does not proselytise to non-Jews and, while not forbidding it, places many limitations on conversion. Further, it is very questionable whether atheists, many of whom are motivated by a belief in individual freedom of conscience, truly endeavour to convince religious-minded people into becoming non-believers. However, the Abrams model is designed only to predict trends in group membership when groups actively compete with one another for members. Seeing as this is simply not the case with actual religious groupings, the model cannot generate reliable predictions about their future extinction. The second is the assumption that there are just two pertinent groups in society, namely, persons who adhere to a religion and persons who don’t. This is an extremely weak assumption because, in reality, there are very many different religious-affiliation groups in contemporary society, each of which will be evaluated individually by potential adherents or apostates. For example, to help people complete the British census form, the UK Office for National Statistics lists abbreviations for a whopping 400 separate religious-affiliation groups reflecting the congregational diversity of British society. This totally undermines the logic of the Abrams model, which is based on the assumption that if a person leaves Group X then he or she will, by necessity, end up in Group Y. As all its projections are based on this process — which does not actually happen — the model’s conclusions about the future extinction of religion must be considered as completely irrelevant to real society. Even allowing for these (clearly) false assumptions, questions can also be raised about the researchers’ attempt to validate the model using census data. This itself is based on the belief that census data provides accurate information about religious adherence, a belief that is again extremely doubtful. One problem is that census forms are usually designed to confer a religious status on children (even on newborn babies) based on the nomination of their parents. It is therefore likely that religion data produced in censuses will be confounded by hundreds of thousands, perhaps millions, of misleading categorizations relating to children who are just too young to reliably testify as to their theistic beliefs (we can note that over 25% of the world’s population is aged 14 or younger). In addition, it is a matter of widespread concern that questions relating to religion are phrased inconsistently in national censuses. Many observers feel that the layout or phrasing of religion questions are designed in ways that are intended to bias the responses so that they over-count the number of religious adherents in the population, thereby serving the vested interests of those whose schools, hospitals, or other services are governed along religious lines. Overall, despite wide news coverage, these researchers did not demonstrate the imminent extinction of organized religion. Firstly, the mathematical model that purportedly forms the basis of their projection was fundamentally flawed because it was based on assumptions that are guaranteed to be false. And secondly, even if their flawed assumptions could somehow be ignored, their use of census data to validate the model would have been highly unreliable. In short, while organized religion may well be on the wane, rumours that its demise has been proven mathematically are greatly exaggerated. Actually the reason religion won’t become extinct isn’t for the reason you mentioned. The team seems to have used phase space behaviour to predict the trajectories of religious affiliation and as such ‘spatial’ variable details won’t actually affect the validity of the prediction. The team is probably wrong but for different reasons altogether (mathematical ones). Thanks for that comment. You’re right, flaws in the mathematics would certainly be a problem for the research team. However, I fear they would dispute the criticism: their methods were peer-reviewed by the American Physical Society, and were published in previous peer-reviewed papers also. On the other hand, the assumptions outlined in the post remain fundamentally flawed. So whether or not the mathematics are defensible, the paper’s predictions are dubious in the extreme. In short, the team is probably wrong for several reasons. The phase space behaviour of a dynamical system does not depend too closely on the type of assumptions of which you speak. If it did it would be entirely impossible to predict the time evolution of dynamical systems given the lack of complete data and given their exponential-sensitivity to initial conditions (thanks to Lyapunov exponents describing close trajectories). To be more edifying: one could study the N-dimensional phase space behaviour of some unknown system for which we have no clue about the underlying assumptions or equations, and still come up with many patterns such as nodes, repellors, saddle points, limit cycles, eigen values and Lyapunov exponents, Poincaré sections, strange attractors, etc. We can then use these to map the behaviour of the system on an N-dimensional manifold and determine how trajectories would evolve over time. We can exploit the shadowing theorem of close trajectories to overcome the ‘exponential divergence of close trajectories in phase space’. Through these methods (and many others), as long as we identify the fixed points (and the more general forms of these) of the system we can then make useful predictions about it. I have not read their paper but from a quick reading I would strongly think they would have used such techniques to predict the system because it is very common in mathematics, and similar methods for LINEAR systems are as common as dirt in engineering (while nonlinear methods are also used in specfic cases: H-space methods for nonlinear robust control for example). As such there is less sensitivity of the dynamics of the system to underlying assumptions as long as the phase space behaviour fits the data. However, my issue with their model is entirely mathematical: first is the fact that they admit to using a linear model, which I fear may not capture the dynamics at all. The second problem that I have is the fact that their system is discrete dynamical at least in some sense. The belief that religion could become extinct on a discrete system doesn’t carry through to the continuous one as can be clearly seen in the likes of a competitive nonlinear differential equation system of the likes of Lotka-Volterra. In Lotka-Volterra it the dynamics almost always results in moments of (real-world) extinction from which teh system recovers because the equations are continuous (not just in time but in space). There, it is misapplied because the dynamical system is essentially discrete in the sense that you cannot have non-integer rabbits and foxes, and it is from these non-integer, near-zero populations (i.e. n<1) that the system periodically recovers. In the continuous case it is mathematically near-impossible to get a extinction condition without placing the set of foxes/rabbits in a one-to-one relationship with the set of natural numbers. In the case of religion the reverse is the case as religious belief is not an integer (or natural number, rather) at all, and the fact that they were able to get extinction out of a dynamical system suggests they it belongs to the set of natural numbers. As such I think we will actually see dynamics more similar to the Lotka-Volterra differential equations where you even if religion almost disappears in a society, it will rapidly resurge again given the interesting dynamics of that system. While, as you put it, the phase space behaviour of a dynamical system does not depend too closely on assumptions, the fact remains that the interpretation of the model’s implications rests ENTIRELY on the assumptions. These researchers assumed: (a) that all religious groups actively compete to draw members away from other groups; and (b) that there are only two such groups in society. Both assumptions are patently false. Therefore, regardless of the mathematics, the model was doomed to be meaningless from the outset. This remains the overwhelming problem with this model, and with the news reports about the research. The mechanics are secondary. Using the fox and rabit analogy is actually the best proof because in a dynamic system of war, there are very little to no athiest in fox holes.